International Journal of Research in Health Sciences,2014,2,1,356-358. 1,2,4- King Khalid University, Abha. Kingdom of Saudi Arabia.1- Lecturer, Department of oral and maxillofacial surgery, 2-Assistant professor Conservative department, 3-Reader, Department of oral and maxillofacial surgery, SMBT Dental College. Sangamner Taluka, India, 4-Assistant professor, Department of orthodontics, SAUDI ARABIA. The impaction may be primary, meaning that the teeth never have been erupted or it may be secondary, meaning that the teeth after eruption are reimpacted. 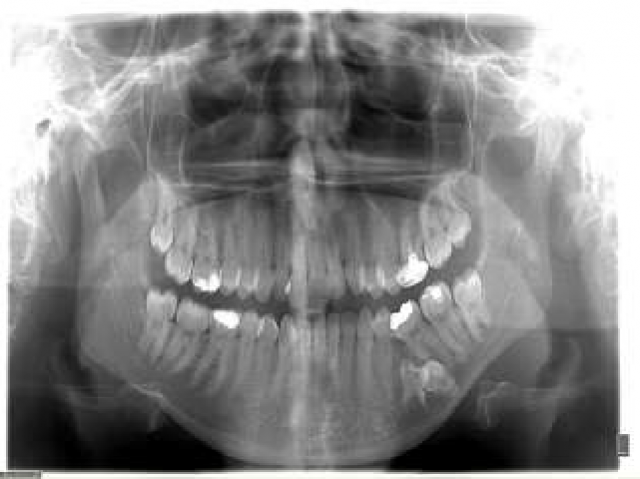 Although impaction of permanent teeth is relatively a common finding, the lack of eruption of primary tooth is apparently a rare finding. When it occurs it is almost always a mandibular molar. The exact factor of primary teeth submersion has not yet determined. Suggested factors are ankylosis, congenitally missing permanent teeth, defects in the periodontal membrane, trauma, injury of the periodontal ligament, precocious eruption of the first permanent molar, defective eruptive force, or a combination of these factors. Mainly, the local and genetic theories have attempted to clarify the causal agents in the etiology of infra occlusion. Extraction has been widely recommended as treatment, in order radiographs revealed an impacted second deciduous molar and impacted premolar close to the lower border of the mandible, and below the adjacent first permanent molar (Figure 2). The adjacent first permanent showed root resorption. Orthodontic consultation was done and due to deeply placed deciduous and permanent premolar and noneruptive position of the permanent premolar, and damage to the adjacent tooth extraction was planned. impacted left deciduous second molar and permanent second premolar close to the base of mandible. resorption of adjacent molar tooth evident.